UPDATE (4/6/13): With extended bidding going well into the night, the 1906 T206 Honus Wagner card dubbed the Jumbo Wagner sold for $2.1 million. This includes a 10 percent buyer's premium. Although this was short of some estimates, it still broke the record for a baseball card in a public sale. That said, it's still well below the $2.8 million paid by Diamondbacks owner Ken Kendricks in 2011 for the famous PSA 8 Honus Wagner that was once owned by Wayne Gretzky. Called the Jumbo Wagner thanks to its slightly over-sized measurements, it's one of the nicest known versions of the legendary card. The Jumbo Wagner has larger borders than every other known version of the legendary card. Graded PSA 5, it's also one of the best condition examples card. It's one of only three cards authenticated and graded 5 or above by a reputable company. The card features a Sweet Corporal back and is highlighted by extremely bright colors. The Jumbo Wagner was last sold in 2008 for $1.62 million. It's almost unheard of for T206 Honus Wagner cards to lose value. It's expected that bidding on the Jumbo Wagner will continue to rise, setting a record in the process. 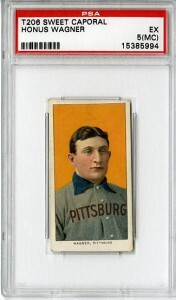 The 1909 T206 Honus Wagner is the most famous card in the history of sports cards. It's believed that around 50 still exist today, however most are in extremely poor condition. Every time one comes up for sale, it's a big deal in the hobby. Usually the stories of such sales branch out into the mainstream media as well. In recent months, the controversial Gretzky Wagner has been called into question as Bill Mastro, the man who brought the PSA 8 version of the card to prominence, pleaded guilty to several counts stemming from auction manipulation and doctoring sports memorabilia. The famous T206 Honus Wagner could become a central part of any further legal action. The T206 Jumbo Wagner was sold though Goldin Auctions.